When people ask me which DNA test I recommend, I turn around and ask them some questions. If what they are after is taking is an “autosomal DNA test,” I may tell them different reasons to take a test with Ancestry or 23andme (and then usually recommend they also upload their Raw DNA onto GEDMatch, FamilyTreeDNA, and MyHeritage to connect with more matches). While I have had many examples of successful connections with the first four sites, I had not any significant breakthroughs with MyHeritage until very recently. My wife’s grandmother Zoila (now 87), had taken a DNA test with 23andme a few years ago. We have uploaded her RawDNA onto all of the sites above (except Ancestry, since they currently do not have that option – I’d need to get another test, and having her take the first test took a very long time!). At the time of the test, I wrote a post about an interesting match she had on 23andme with someone who was also related to her late husband. I recently looked at her matches on MyHeritage. After her four known relatives whose DNA kits I also manage, her highest match was Francisco, someone unknown to us (see test results, above). One set of his great-great-great-grandparents – Juan Gonzalez and Francisca Tejada – were his ancestors in four distinct ways; another set – Bernardo Pantaleon and Maria Tejada – were his ancestors in five distinct ways. This was a very close match, predicted to be around second cousins; Francisco had an online family tree that went back several generations, but there was no immediate way I could find a connection. However, as the chart below will demonstrate, Francisco had a rather large amount of “recent endogamy” – cousins marrying and having children with other cousins. One set of his great-great-great-grandparents – Juan Gonzalez and Francisca Tejada – were his ancestors in four distinct ways; another set – Bernardo Pantaleon and Maria Tejada – were his ancestors in five distinct ways. To further complicate the kinships, Maria Tejada was a niece of both Juan Gonzalez (her mother’s brother) and Francisca Tejada (her father’s sister). 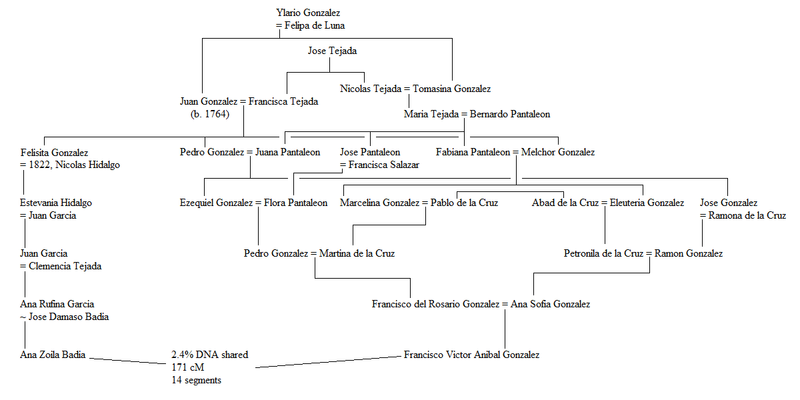 While I was reasonably sure Zoila and Francisco were not second cousins, if they were related through these families that Francisco descended from multiple times, that connection would more than account for the closer DNA match. The common surnames in their trees were Tejada and Gonzalez. Zoila’s maternal grandmother, Clemencia Tejada, was the daughter of Blas Tejada and Carlota Faña of Las Vega, Dominican Republic. Zoila’s father’s maternal grandparents were Nicolas Hidalgo and Felisita Gonzalez, who married in San Francisco de Macoris in 1822 (no parents were listed on this record). I had no ancestors behind Blas Tejada or Felisita Gonzalez but, now aware of this significant DNA match, set out to do more research. Through Juan Gonzalez and Francisca Tejada, Zoila and Francisco are fourth cousins in four unique ways. Through Juan’s parents Ylario Gonzalez and Felipa de Luna, Zoila and Francisco are fifth cousins once removed in five unique ways. Through Francisca’s parents Jose Tejada (and his wife), Zoila and Francisco are fifth cousins once removed in five unique ways. I think this more than accounts for their close DNA match, predicting a kinship of second cousins, despite their last common ancestors living in the eighteenth century! I still have not found a way two of Zoila’s Tejada ancestors tie in (Blas Tejada above, and this newfound ancestor Petrona Tejada, Nicolas Hidalgo’s mother), but Francisco has connected me with another cousin who is aiding in this research. Thanks to this DNA connection, I identified nine new ancestors of my wife from records I had already seen before, and records that this distant cousin had researched himself. Not bad for my first “fruitful” connection through MyHeritageDNA! I would be very cautious about having DNA tests done. The most that any commercial company can do is 1) tell you the geographic area from which your ancestors came from, and 2) tell you if and who in their own company’s database you may be related to. But there is a dark side of DNA testing that goes into greater risks. The primary problem is the security of your own personal DNA information. Both the government and big pharma want your DNA information, and companies like 23andMe have already established links to big pharma. Do you agree with that? Additionally, once the government has your DNA information (and none of the commercial DNA company’s databases are secure), you are at risk as being identified as a criminal by government. Do you want that? How does that suit you? You might also ask why the government of a country that is allegedly ‘free’ would want to have everyone’s DNA. Fourth Amendment? The Fourth Amendment does not apply if you voluntarily surrender your own DNA into a database in which the government can gets its hands. This is not to suggest that commercial genealogical DNA tests are bad or that you should not get the tests done – this is only a suggestion that you be cautious if and when you decide to do the deed. A fascinating study! Congratulations on unraveling the connections. I have often looked at some of my close matches and thought that they must be farther back than they looked because of either multiple connections in Colonial New England or early Quaker communities, but this really brings the idea home. Chris,Thanks for this useful example of DNA in your research. You remind me that I need to take a closer look at having multiple tests run for my wife and / or her family members too. Nancy’s coming in on AncestryDNA with about 16 different ethnicities (from the Baltic States to the Bantu to the Andean tribes, etc..) so I’d like see as many “glimpses” as possible – not to mention the help other testing might provide in filling in a few more lines of her Bloodgood family tree. For me, when it comes to DNA testing, the benefits will always be – at the very least – equal to the risk. Some years ago I worked for a Catholic diocesan newspaper and was assign to write a story about American immigrant relatives of a recently canonized priest from Jalisco named Cristobal Magallanes. With the aid of a Mexican genealogist, I was able to verify these relatives’ family tradition that St. Cristobal was their (somewhat distant) cousin. This experience with Mexican genealogy introduced me to the factor of endogamy in the families within Mexican villages — it’s likely that almost everyone in St. Cristobal’s village is his cousin at some degree or other, and probably related to him along more than one line, in the sort of ways Chris Child has explained here. It comes about when geography and smaller population size limits the available candidates for marriage, a lot like what I’ve found with my wife’s early Connecticut ancestors.